Whether the focus is on a new project, fresh talent or the next quarter’s financial projections, professional services firms are under pressure to constantly plan ahead. SkyProject, our project management module, enables you to plan, organise, secure and manage your project resources to ensure successful completion. We facilitate team collaboration, execution and ensure real time information is aligned to your goals and readily available in customisable form. 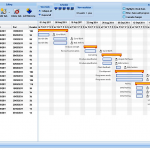 The project management software follows information from tender (estimate) to automatic project creation.